Fiocchi .22 Caliber Long Crimped Smokeless Blanks -- 200 ct. $29.95. Fast shipping. Would recommend buying your dog supplies here. Always happy with my purchases here. Keep up the good work. I have fired at least one hundred rounds and not a miss fired yet. Great sound for training. Good price/value. No misfires so far after firing several through Alpha .22 starter/training pistol. Easy to load/unload and they are noticeably louder than the smaller acorn blanks. I have not had the dog in the field to try them out yet, but they fit in all my 22s and in the clips. Great so far. No jams yet. They load easily. Works very well in my Alfa pistol. No sticking of spent shells. "They're perfect for their intended use." They're perfect for their intended use. Our working dog is a Schutzhund 1 now working on his 2. The starter pistol that I purchased from you is used at the club for training and trials. So ammo was needed. "Good product. Glad I bought it." Good product. Glad I bought it. "Delivered on time, priced right, and fires clean." Delivered on time, priced right, and fires clean. Great product. I have fired a whole box, and I did not have one misfire. Every round had the same sound. Great for just training. Plenty loud without hurting my ears. Clean burning powder, no smoke, little residue. Good stuff. Also, shipped VERY fast, which I very much appreciate. As advertised, they are REALLY LOUD!! The downside to that is, because they have more powder they expand the casing when fired and its tough to get the casings out. I use them for training and haven't had any problems with them. Good product. Only had one not fire out of the 50 I shot to date. Only shot 24 rounds, but good report from 22 blanks. No problem with ejecting, so these are one I would buy again. "Shipped and delivered on time." Shipped and delivered on time. Provides reasonable noise level for early training. "Much easier to load. However, they tend to stick in the barrel when trying to re-load." Much easier to load. However, they tend to stick in the barrel when trying to re-load. Hello, they worked just fine, but I found them to be much to quiet for my training purposes. I have a cap gun that is just about as loud. These would be fine for the first step in introducing a pup to gunfire, but after that they are too quiet. That being said, I should have researched them a bit more to find out if they would be what I needed. Thank you. Wish they weren't smokeless. Gun show goes over better if there is smoke. Would not recommend to anyone. One of the louder .22 blanks that we sell. Recommended for dogs already conditioned to gunfire. Restricted shipping. ONLY available in US48 via FedEx Ground. Not compatible with Ekol ES Viper, Champion or 880 (Olympic 6) Blank Pistols. Not recommended for use in theatrical productions or indoors. Not recommended for Track and Field or starting other sporting events. It is our understanding that only Black Powder Blanks should be used for these events. 6mm / 22 caliber x 5/8" length crimped blanks. 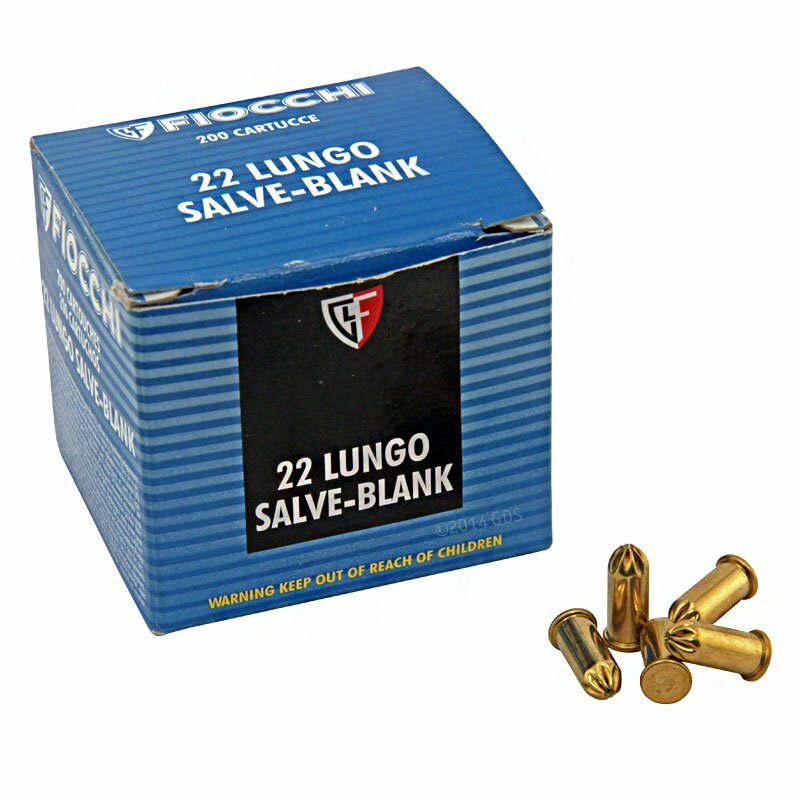 Fiocchi "Long" .22's are one of the louder .22 blanks that we sell and use smokeless powder. Recommended for dogs already conditioned to gunfire. Use and/or possession of Blank Pistols (Starter Pistols) and Blanks is prohibited and/or restricted in some jurisdictions. Laws change frequently. Therefore, all buyers should check with local authorities prior to ordering pistols and/or blanks. WARNING: Lead Warning: Discharging firearms in poorly ventilated areas, cleaning firearms or handling ammunition may result in exposure to lead and other substances known to cause birth defects, reproductive harm and other serious physical injury. Have adequate ventilation at all times. Wash hands thoroughly after exposure.